Many recipes claim to be quick and easy, but few live up to expectations. With the craziness of the holiday season, I’ve been wanting–and needing—quick-to-pull-together lunches. Given the choice, I prefer not to have cold lunches so sandwiches or salads are out. In the end, I usually have leftovers or cook something easy. 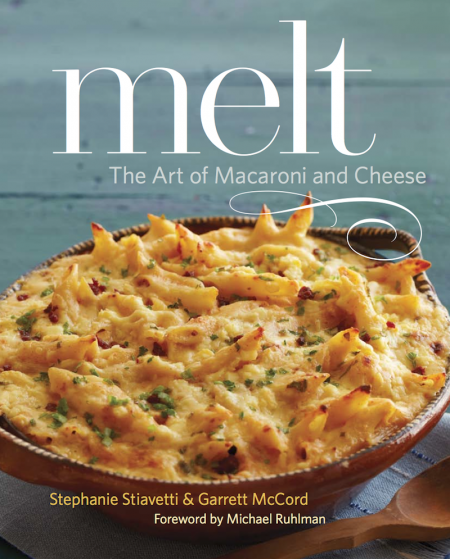 When Stephanie Stiavetti sent me her just-released cookbook co-authored with Garrett McCord, Melt—The Art of Macaroni and Cheese (Little, Brown & Company, November, 2013), I was blown away by the gorgeous photography and creative mac and cheese combinations. 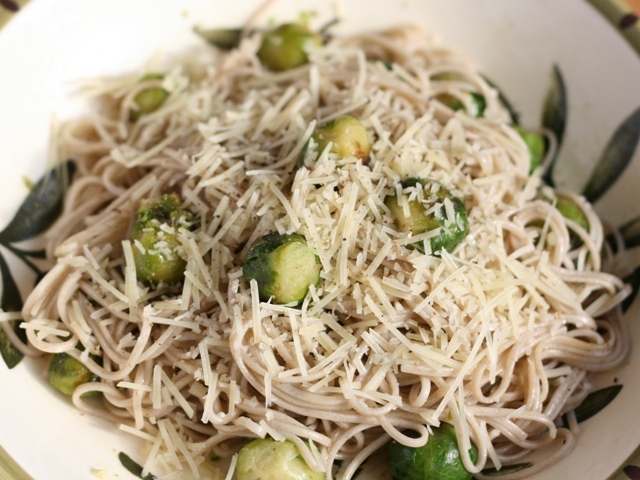 While flipping through the book, I came across a recipe that called for soba, Brussels sprouts and parmesan. It sounds like an odd combo, but if you’re an eclectic cook like me, you probably have these ingredients sitting right in your pantry. The recipe was oh-so brief and simple; I was sold! I did tweak the recipe a little, using frozen Brussels sprouts instead of fresh ones and the dish came together in barely 15 minutes. Now the true test—did it taste good? Given its simplicity, I was astonished at how tasty it was—the bittersweet sprouts played very nicely with the salty Parmesan and the chewy soba bundled the flavors together well. This recipe is a winner on so many levels: it satisfies, uses few, easily available ingredients, and is indeed a 15-minute meal. For more info about Melt, please visit Stephanie’s blog: theculinarylife.com or check out their book trailer here. It’s perfect for the cheese-lover on your Christmas list! The original recipe uses fresh Brussels sprouts but I had frozen ones in the freezer. They added to the brevity of cooking time. If you do use fresh, be sure to remove the stems and outer leaves. Halve them and blanche them for quicker cooking. Wholewheat spaghetti would be an excellent substitute for the soba. Thaw/cook the Brussels sprouts in the microwave on high for about 4 minutes. Drain excess water. Meanwhile, prepare the soba per the manufacturer’s instructions. Once they are cooked, immediately drain and rinse under cool water for a moment, drain again, and then toss with 1 tablespoon of olive oil. Do this regardless of what the noodle instructions say at that point, as some may instruct you not to add oil. Set aside. Place the remaining tablepoon of olive oil in a skillet over medium-high heat. When the oil is hot and shimmering, add the Brussels sprouts. Season with salt, pepper, and chili flakes. Cook, stirring occasionally, until the sprouts start to turn golden brown, about 4 to 5 minutes. Add the garlic and cook until fragrant, about 30 seconds. Toss the soba in the hot pan for about 30 seconds. Remove from the heat and add an extra glug of oil, if you desire. Plate and shower liberally with Parmesan. Serve immediately. 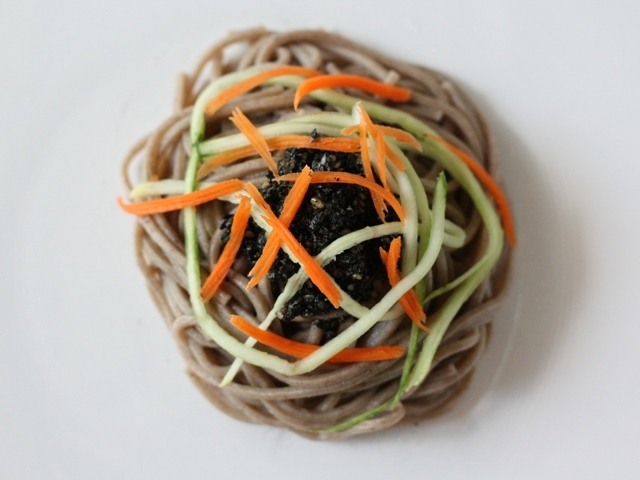 Soba, made from buckwheat flour, is prettily packed in bundles about 8 to a package. Note that many sobas are also made with wheat flour so it isn’t a gluten-free food. 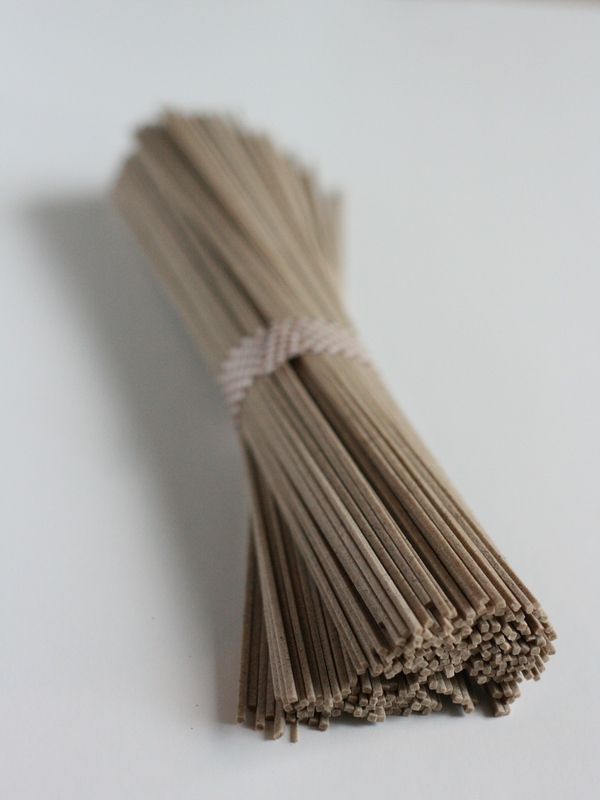 Juwari, the finest–and usually most expensive–soba is made entirely of buckwheat, but please please read the labels especially if you are allergic or intolerant to wheat! This is turning out to be my go-to recipe for a simple summer lunch. It’s done in 15 minutes, even less if you make the sesame paste ahead and refrigerate. Top the noodles with whatever you have on hand—poached chicken, pan-fried tofu, pickles, your options are only limited to what you have in your fridge! Grind the sesame seeds with a mortar and pestle, or in a small food processor, until it resembles coarse black sand. Stir in the rice vinegar, soy sauce, sesame oil, mirin, sugar, and chili flakes and mix until a smooth paste forms. Taste and adjust accordingly. Cook the soba according to package directions, reserving 1/3 cup of the cooking water. Rinse the noodles with cold water and drain. Thin the sesame paste with the cooking water and toss with the noodles. Garnish with cucumber and carrot and slurp up! This dish is tasty eaten at room temperature or chilled first.